To provide the basic facilities to every nook and corner of the Arunachalee society, Vivekanada Kendra Arunjyoti - a service project was started in 1993 with the motto - “Development Through Culture”. 2nd August, 2015: Vivekananda Kendra Arun Joyti, this year also conducted Guru Purnima Programe in Various Prayer Centre of Arunachal Pradesh located in all the District In all six places of state capital the message of Guru-Shishya Parampara was conveyed. The Guru Purnima is celebrated on the eve of birthday of Maharishi Ved Vyas who has collected and compiled the voluminous store of in depth Knowledge of indigenous faith discovered by seers over the ages, which was on the verge of extinction and started Gurukul system. To preserve and protect it he considered Father of the family as Guru in a Micro level. In Central Nyder Namlo, Doimukh. Shri T.T. Tara DDSE spoke on the importance of Guru Purnima and Shri Nabam Atumji felicitated the Revered Priest Shri Techi Rintu of Rono village Nyeder Namlo and Shri Tana Tath of Kheel Nyeder Namlo. In Nyeder Namlo, Pachin Colony, Naharlagun. Vivekananda Kendra Karyakartas took active initiative and felicitated Priest. Revered Priest Beloved Tadar Sonu was felicitated by Shri Kalyan Dutta, Mahanagar Pramukh, Vivekananda Kendra, Capital Complex and Shri Taba Tatup, Prant Karyalaya Pramukh for his remarkable contribution in the welfare of people in Arunachal Pradesh. While speaking on the Importance of the day Shri Kalyan Dutta pointed that this is the Day to remember our whole tradition of Guru starting from Ved Vyas to offer our respect to the Guru to Guides us in life, who has handed over the tradition of knowledge and wisdom to us. This is also a day to express our gratitude and commitment to the Guru for carrying forward our culture vibrantly with the vision of Krinvanto Vishwamaryam-Let us make the whole world Noble. He appealed all the father and mother of the family to maintain quality of Guru to make a child an Ideal Citizen of the mother land. In Naharlagu Nyeder Namlo at E–Sector Priest Smti Gyamar Deriang was felicitated by Shri Rekhi Tana Tara, Chairman Central Nyedar Namlo, Arunachal Pradesh. In Hollongi Nyeder Namlo Priest Shri Dur Talo Camdir was felicitated by one of the Senior teacher Shri Pankaj and Shri Romin Rava, Karyakarta of Vivekananda Kendra. In Donyi Polo Gangging, Itanagar also Vivekananda Kendra conducted Gurupurnima function. The celebration was started by the chanting of prayer by Taabe (Priest) Shri Tamak Komut. The importance of the day was highlighted by Dr. V.N. Sharma, State Liaison officer, NSS who is also a Vivekananda Kendra Karyakarta. He also felicitated Revered Taabe Mukge Tayeng of Donyi Polo Gangging at Itanagar. In Meder Nello E-Sector, Itanagar. Revered Priest Milo Tanyo was felicitated by Shri P.N. Singh, Senior teacher. The Meder Nello committee member welcomes all the Kendra Karyakarta with Khada (muffler) as a mark of respect. Guru Purnima should strengthen our resolve. Thus, the occasion should reflect the solemnity, clarity and also divine touch to make deep impressions on the mind – to awaken the need of furthering our tradition and energize them to work for it. 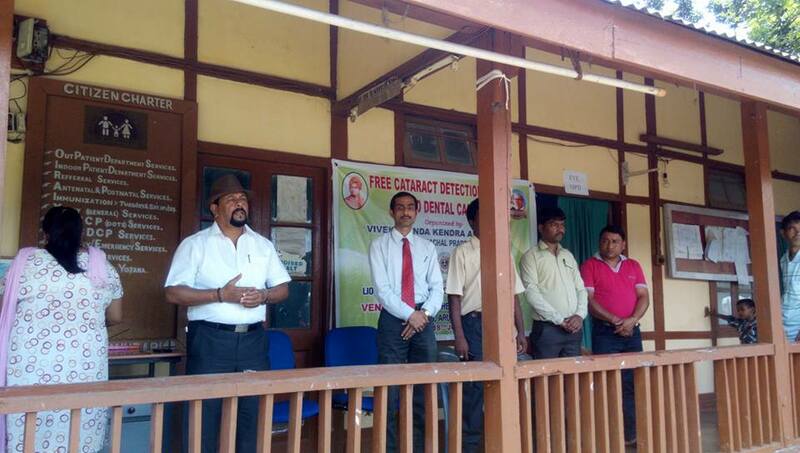 Vivekananda Kendra Arun Jyoti recently conducted free medical camps in Longding district of Arunachal Pradesh. On 19th July the team organized camp at Niaunu village in collaboration with All Niaunu Student Association (ANSA). 435 patients were examined and free medicines were distributed. District Health Society (National Vector Borne Disease Control Program), Longding district distributed 150 Long Lasting Medicated Mosquito nets at the same venue. DVBDC Program Officer, Dr. W.Wangsu was present during the camp. On 20th July the medical team of Arun Jyoti conducted the camp at Govt.Middle School, Niausa. 144 patients were examined and medicines were distributed accordingly. As a part of Mananeeya Eknathji Janma Sati Parva , the founder of Vivekananda Kendra Kanyakumari, a Free Eye Screening and Dental Camp was organized at Kanubari Community Health Centre of Longding district of Arunachal Pradesh on 18th June 2015. The camp was organized by Vivekananda Kendra Arun Jyoti in association with Lion K.K.Saharia Eye Hospital, a premier Eye Hospital of Dibrugarh, Assam. The eye team screened 78 patients and 8 cataract patients were identified. The patients will be operated free of cost at K.K.Saharia Lion Eye Hospital,Dibrugarh.The other patients were advised for spectacles and free medicines were distributed amongst them. Dr. Amit Singh, BDS also examined more than 100 patients for various dental diseases. He talked to the students about oral hygiene and proper brushing technique. 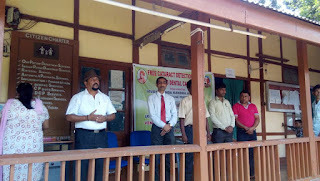 The camp was inaugurated by Sri S.S.Choudhury, ADC of Kanubari. He lauded the efforts of Vivekananda Kendra Arun Jyoti in the field of rural health care and assured all possible help from his side. In the coming days more such camps will be conducted in different parts of Arunachal Pradesh in association with Lion K.K.Saharia Eye Hospital, Dibrugarh. Vivekananda Kendra Arunachal Prant has organized Seven Days Prant Karyakarta Prashikshan Shibir on 23rd to 29th May 2015 at Vivekananda Kendra Vidyalaya Oyan. There were 48 Karyakarta. Ma Kishor Tokekar (Joint General Secretary of Vivekananda Kendra, Jeevanvarti Karyakarta) inaugurated the Shivir. Ahuti Satra was taken by Ma. Pravin Dabolkar (Joint General Secretary of Vivekananda Kendra, Jeevanvarti Karyakarta) he is briefly explained of ‘Ahuti Satra’.